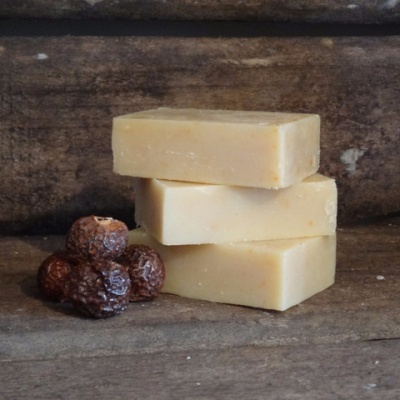 A natural, vegan shampoo bar. Handmade in the UK. It's an old concept, a soap bar you can use on your hair but it actually works. This shampoo bar is a great and convenient way to wash your hair, face and body. It also makes a great shaving bar too! GREAT FOR: Moisturising & Conditioning. Great for thick curly dry hair! Suitable for skin prone to dryness & inflammation. INGREDIENTS: Organic Sapindus mukorossi (soapnut) fruit extract, Olea europaea (olive) fruit oil, Organic Cocos nucifera (coconut) oil, Organic Ricinus communis (castor) seed oil, Sodium hydroxide*, Organic Theobroma cacao (cocoa) seed butter, Organic Cannabis sativa (hemp) seed oil, Pogostemon cablin (patchouli) leaf oil, Thuja orientalis (cedarwood) leaf oil, Pelargonium graveolens (geranium) oil, Capsicum frutescens (cayenne pepper) fruit powder, Kaolin (and) Illite (and) Red iron oxides, geraniol**, citronellol**. + ORGANIC WILDCRAFTED SOAPNUTS have been used in Ayurvedic medicine for centuries to treat sensitive skin, eczema, hair and scalp problems. Soapnuts have skin & hair softening properties, as well as a mild anti-bacterial and anti-microbial function and because of this they have been used in Ayurveda to treat infections and to help keep the skin/scalp free from bacteria. + ORGANIC HEMP OIL conditions your hair and scalp with the high content of vitamin E. Hemp oil is a natural moisturiser that is soothing and will help to prevent irritation and dryness. Great for winter, because it combats the cold, damaging outdoor air. + CAYENNE PEPPER is known to promote hair growth because it has a stimulatory effect on the scalp. It also helps with adding shine to lifeless hair.